Every massive galaxy has a black hole at its center, and the heftier the galaxy, the bigger its black hole. But why are the two related? After all, the black hole is millions of times smaller and less massive than its home galaxy. A new study of football-shaped collections of stars called elliptical galaxies provides new insights into the connection between a galaxy and its black hole. It finds that the invisible hand of dark matter somehow influences black hole growth. "There seems to be a mysterious link between the amount of dark matter a galaxy holds and the size of its central black hole, even though the two operate on vastly different scales," says Akos Bogdan of the Harvard-Smithsonian Center for Astrophysics (CfA). This research was designed to address a controversy in the field. Previous observations had found a relationship between the mass of the central black hole and the total mass of stars in elliptical galaxies. However, more recent studies have suggested a tight correlation between the masses of the black hole and the galaxy's dark matter halo. It wasn't clear which relationship dominated. In our universe, dark matter outweighs normal matter – the everyday stuff we see all around us – by a factor of 6 to 1. We know dark matter exists only from its gravitational effects. It holds together galaxies and galaxy clusters. Every galaxy is surrounded by a halo of dark matter that weighs as much as a trillion suns and extends for hundreds of thousands of light-years. To investigate the link between dark matter halos and supermassive black holes, Bogdan and his colleague Andy Goulding (Princeton University) studied more than 3,000 elliptical galaxies. They used star motions as a tracer to weigh the galaxies' central black holes. X-ray measurements of hot gas surrounding the galaxies helped weigh the dark matter halo, because the more dark matter a galaxy has, the more hot gas it can hold onto. They found a distinct relationship between the mass of the dark matter halo and the black hole mass – a relationship stronger than that between a black hole and the galaxy's stars alone. 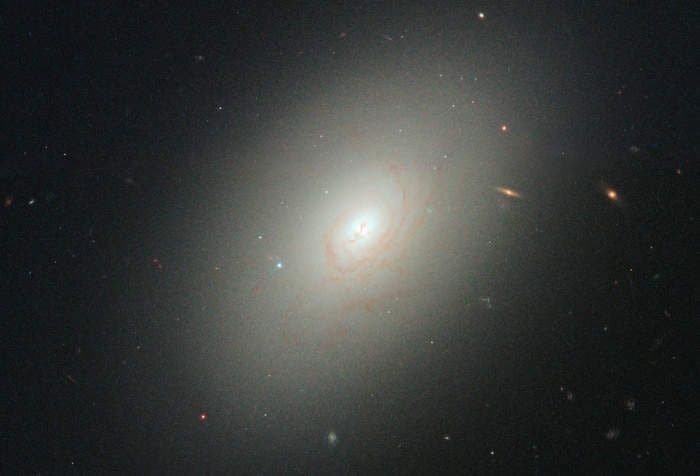 This connection is likely to be related to how elliptical galaxies grow. An elliptical galaxy is formed when smaller galaxies merge, their stars and dark matter mingling and mixing together. Because the dark matter outweighs everything else, it molds the newly formed elliptical galaxy and guides the growth of the central black hole. "In effect, the act of merging creates a gravitational blueprint that the galaxy, the stars and the black hole will follow in order to build themselves," explains Bogdan. The paper describing this work has been accepted for publication in the Astrophysical Journal. This result relied on data from the Sloan Digital Sky Survey and the ROSAT X-ray satellite's all-sky survey.